It’s hard to create a more sustainable electrical firm without cleaning up the supply chain while you’re at it. But how can electricians make the move toward a green supply chain? If we break down the electrical supply chain into discrete steps, environmentally beneficial changes become clear at each point. Choosing and working with suppliers. As the customer, you have your choice of electrical material distributors to work with. Choose one that’s already committed to reducing waste and energy; insist that your dealers use recyclable packaging, or, better yet, no packaging at all. 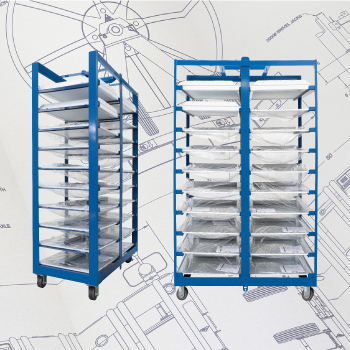 New products like the Light Fixture Cart can help dealers and end-users both handle large volumes of electrical materials without resorting to excessive packaging. Reusing or recycling packaging at the job site. There’s no point asking your distributor to use recyclable shipping crates if you don’t end up recycling them after use. Electrical firms can partner with local recycling organizations to ensure all packaging ends up at a materials recovery facility that can reintroduce it to the market. Finding ways to safely dispose of replaced components. When you rewire a building, you end up with lots of old electrical cable. These products are full of valuable recyclables — assuming you can get them into the right hands. Talk to local recycling organizations to find out which haulers accept used cable, wire, and other electrical supplies. But making the change could benefit more than the environment. Customers pay attention to their electricians’ environmental record. Build a green supply chain and you might notice a substantial uptick in business. Glavinich, Thomas. “Managing Your Supply Chain.” ECMag. Electrical Contractor Magazine, May 2002. Web. 12 Mar. 2019. Hsu, Chia-Wei and Allen Hu. “Green supply chain management in the electronic industry.” ResearchGate. International Journal of Environmental Science and Technology, 2008. Web. 12 Mar. 2019. Klein, Melissa et al. “Improving Environmental Sustainability in Supply Chains: Best Practices Webinar.” EPA. Center for Corporate Climate Leadership, U.S. Environmental Protection Agency, 9 Sept. 2016. PDF. 12 Mar 2019.